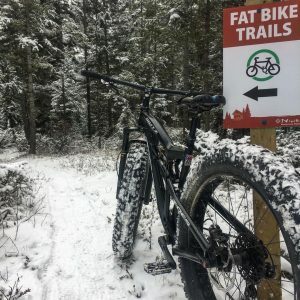 The 5th Annual Wintershines SnowFondo is a free recreational fat bike ride of ~12.5, 25, or 37.5km with fun trails accessible for all riding abilities. This year’s ride will take place exclusively out at the new Man of the Trees Winter Fat Bike Trail Network at the SW edge of the City Limits near Cedar Villa. We are excited to feature these new trails groomed using our grooming equipment recently purchased through a Wintershines grant and the “Well Groomed Fatbike Funraiser” event we organized this past fall. A Purple course will contain more twisty single-track requiring a bit more balance, and the Orange course will allow riders to bypass portions of the tighter single-track. This way you are able to mix and match your ride as you like. This is not a race, rather the focus is on exposing more folks to winter recreational riding in a fun social event. We will have several leaders for various speeds and abilities and you can link up with the group that meets your fitness and experience. Full event participation guide will be available shortly and posted here on our website. An enormous effort has gone into creating and designating these trails for Winter Fatbiking – come check them out. For more details please click on this SnowFondo link. Time to get your fun on during Wintershines 2018! Sign up for this one of a kind fatbike event – a super fun mashup; of cyclocross, BMX, Mountain Bike, and Fatbike – the equivalent of monster truck obstacles on a 1.5 to 2 km course. 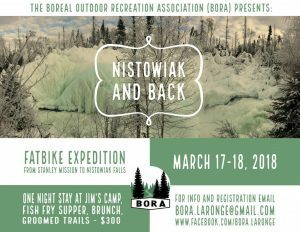 You won’t want to miss this extraordinary fat bike adventure hosted by our friends at BORA, the Boreal Outdoor Recreation Association of La Ronge! To join us for the club rides on Tues evening (6:30 pm) and Sunday afternoon (1:30 pm) club rides (meeting at the old Mendel Art Gallery) we require you to be a member of the Sask Cycling Association (SCA). The 2018 membership does not become available until later in December. If you are not currently a member of the SCA then you can fill out this event form and pay the $20 and then get a full 2018 membership when they become available. Either mail it to the SCA or bring it with you to the ride. Thanks so much and we hope to see you out! 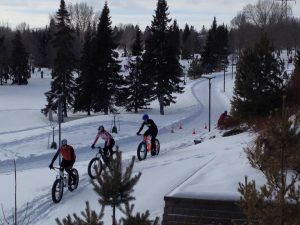 Frosty’s Fat Bike Race Series is geared toward fat bikes racing on snow. Started in 2014, they are excited to be back for 2018. Frosty’s Fat Bike Race Series was born out of the need for a competitive outlet for cyclist wishing to test their skill, fitness and mental fortitude against the elements of Winter. Specially selected venues allow riders to compete and enjoy the grin inducing euphoria that only Snow Biking can produce. Frosty, the mysterious and formidable Utah Yeti, is the mascot and host of these events. This is your opportunity to play in the cold of Winter and prove your Yeti snow handling skills and suitable for all skill levels including beginners and first timer’s! Other groups that rely on volunteer hours to groom ski trails throughout the city have been busy at work since the great snowfall we had this weekend. To ensure fatbikers maintain a good relationship with other user groups in the city, please do not ride your fatbike on groomed ski trails. 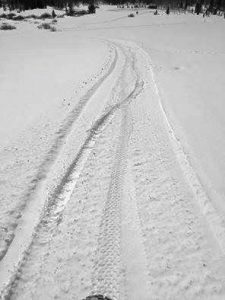 The ruts caused by fatbike tires destroy the pack for skiing. Here is a photo that shows the difference that high and low tire pressure makes on a trail. The high pressure sinks deep, creating ruts and making for a heavy slog of a ride. The low air pressure allows the rider to float on top of the snow for a radically good ride! Here are a few articles about how to adjust your tire pressure depending on snow conditions. This will ensure the mixed use trails we do use are in the best condition they can be for all users, and that you have the maximum FUN out there. Calculate the proper tire pressure if you store your bike indoors. 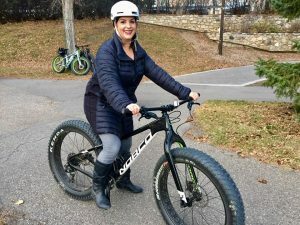 This year’s Global FatBike Day is Saturday, December 2, 2018. This is a free event. 2016 was a huge event with 80 riders; lets see if we can break the 100 barrier this year!!! Plan to ride your FatBike (or rent one from a local bike shop or loan one from a buddy) in celebration of Global FatBike Day. Join others around the world in this celebratory ride. The ride departs from Victoria School at 1:30pm. Meet at the stage in front of the school at broadway and 11th St. There will be something for everyone and every ability, from a wide double track roll along the Trans Canada Trail, too some narrow single track offshoots for those that want a more challenging route (weather allowing). Social event at the Hose (across from Victoria School) for after the ride. We are able to place our steeds on the deck in full view after the ride but welcome to bring a lock and leave it on the Hose deck for post ride. Here is a link to the fabulous photos taken by Bob Holtsman during Well Groomed, A FatBike FUNraiser. Once we have the final amount raised we will post that here. A few images from the Well Groomed FunRaiser last night at LBD. Big shout out to Paul Buffel and his hardworking group of volunteers for a fantastic event! One sleep left before the FatFun begins Friday at LBD, 7:30 pm. 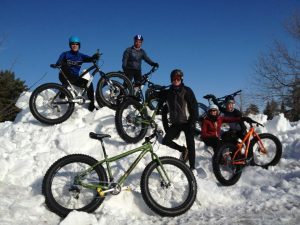 This morning a group of early rising FatFunSeakers pedalled the Bessy trails while Janella Hamilton of CTV interviewed three members of Fatlanders Fat Tire Brigade about the Joy of FatRiding and Well Groomed, A FatBike FUNraiser. Click on the links below for a dose of FatJoy. BORA, the Boreal Outdoor Recreation Association of La Ronge, has just confirmed they are donating to our auction. We are so excited about this item we can barely contain ourselves. Yet, we are. You will have to be in attendance to find out what adventurous journey you could be a part of in March of 2018. We’ll have a drone video to get your juices flowing tomorrow night. Buy your tickets now, while there are still have some left. Tomorrow morning Well Groomed, A FatBike FUNraiser will be featured throughout the morning news live on CTV. Watch for us or join us at 7:23, 7:50, 8:15 and 8:40am, at the Bessborough by the river, as we make our own fun in front of the camera. The final auction items have arrived and what fun THEY are! Our live auction items are the Carbon Salsa Mukluk Fat Bike Frame plus $50 off a custom build package thanks to the Bike Doctor and Salsa Cycles, three resorts that have shown their support, two in-province; Elkridge Resort with a 2 night stay for 2 with breakfast, and 4 rounds of golf, Outerbanks with a 2 night stay for 4 in their Riverside Cabins, and from BC, Nipika Mountain Resort with a 2 night stay in their luxurious hand-built cabins and one of the first resorts to groom trails specifically for FatBikes. Four local bike shops; Bike Universe, Bruce’s Cycle Works, Doug’s Spoke ‘N Sport and Bike Doctor have donated items that will keep you warm on those winter trails. Doug’s has even supplied the bike parts that we are tying the helium balloons to, to keep from floating away – thanks Doug’s! On the theme of winter recreation, businesses such as Eb’s Source for Adventure – Mountain Hardware backpack, Escape Sports – women’s snowshoes, Outtabounds – Patagonia backpack, Outter Limits – gloves, socks, and dry sack, and the Better Good – certificate, have what we need to keep the silent auction focused on Making Our Own Outdoor Fun. Aimy and Trent Theissen have donated an Eb’s gift certificate and two West Coast Trail t-shirts, a reflection on a past Source for Adventure! Saskatoon Massage Therapy Supply will “heat and heal” you with a 30-minute infrared sauna session at Broadway Health Collective. Bid on this and one or more of the other treatments being offered by BHC practitioners for a great wellness experience. 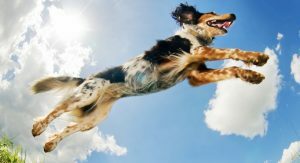 Woofgang & Co. Family Pet Grooming has donated a grooming package that adds to the dog friendly section of our auction. And to close on the theme of this post: “Make your own fun,” we had a most wildly creative and supper fun donation come in today. Auntie Tutu’s aloha and ‘ukelele party for 7! Auntie tutu (aka Roberta) brings the ‘ukeleles, the music, and the fun to all you Well Groomed partiers. She assures us that talent is not required. A sense of adventure is. Buy your tickets now and join the adventure as we Make Our Own Fun this Friday evening!